The Detroit Lions were undefeated at 5-0 as they faced the San Francisco 49ers on November 4, 1956. Coached by Buddy Parker, the Lions had an offense led by fiery QB Bobby Layne, recovered from a shoulder injury that devastated both him and the team in ’55. Big Leon Hart (6’5”, 255) had been shifted from end to fullback with favorable results and rookie Howard “Hopalong” Cassady, the Heisman Trophy winner out of Ohio State, was at halfback. The tough defense continued to be the key to the team’s success and featured MLB Joe Schmidt and safeties Jack Christiansen and Yale Lary. The 49ers had a first-year head coach in Frankie Albert, formerly a star quarterback for the team, and were stumbling along at 1-4. Veteran QB Y.A. Tittle had been benched in favor of rookie Earl Morrall but there was still plenty of talent, especially in the backfield and among the receivers. San Francisco had lost a close game to the Lions two weeks earlier in Detroit. There were 46,706 fans in attendance at Kezar Stadium and they saw a scoreless first quarter. A promising possession for the 49ers ended at the Detroit 10 when FB John Henry Johnson, whose 54-yard carry was the big play in the series, tried to convert a fourth down and was stopped for a four-yard loss. Early in the second quarter the Lions drove 70 yards in 10 plays. Leon Hart (pictured above), who gained 29 yards on five carries along the way, blasted into the end zone from three yards out to put the visitors on the board. Bobby Layne, now also the team’s placekicker, added the extra point. The lead didn’t hold up for long as HB Joe Arenas took the ensuing kickoff and returned it 90 yards for a TD. Gordie Soltau converted to tie the score. The Niners then retained possession with a successful onside kick that gave them the ball at the Detroit 47. They advanced 22 yards before Soltau kicked a 30-yard field goal to give San Francisco the lead. Layne kicked a 30-yard field goal for the Lions before the first half was over and the score was tied at 10-10 at halftime. The Lions went 80 yards to score again in the third quarter, with Hart and “Hopalong” Cassady gaining 58 yards on the ground between them, Layne completed a pass to end Jim Doran for 17 yards, and it was Hart once more reaching paydirt from a yard out. Layne kicked the point after. San Francisco came right back with a series that led to another Soltau field goal, this time from 40 yards. With five minutes remaining, Hart left the contest with an ankle injury and the Lions began to bog down on offense. Taking possession at their 11 in the game’s climactic series, the 49ers drove to the Detroit two yard line. But, following a one-yard gain, an apparent dive across the goal line by Johnson was nullified by a penalty. Johnson was tossed for a seven-yard loss on the next play and HB Hugh McElhenny’s option pass into the end zone was intercepted by Jack Christiansen. With less than two minutes remaining, it clinched the win for the Lions by a score of 17-13. The Lions had the edge in total yards (283 to 246), with 194 yards of that total coming on the ground, and also in first downs (19 to 15). Each team turned the ball over three times. Leon Hart rushed for 77 yards on 16 carries that included two touchdowns before leaving the game and “Hopalong” Cassady gained 78 yards on 19 attempts. Bobby Layne had trouble with his passing accuracy, completing only 7 of 18 throws for 80 yards, but completions to Jim Doran of 14 and 17 yards kept each of the touchdown drives going. 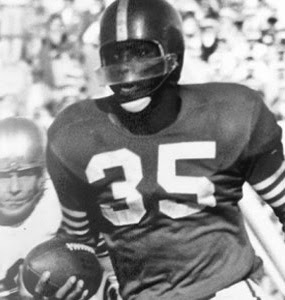 John Henry Johnson (pictured above) accounted for 92 of San Francisco’s 93 rushing yards. The Lions finally lost for the first time the next week at Washington and ended up second in the Western Conference with a 9-3 record after losing a season-ending game to the Bears in which Layne was knocked out of the contest on a notorious late hit by DE Ed Meadows. San Francisco fell to 1-6 before catching fire and going 4-0-1 to finish out the season at 5-6-1, placing third in the conference. 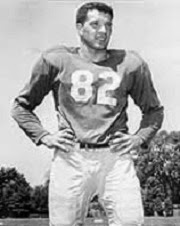 Bobby Layne was a consensus first-team All-NFL selection as he not only passed well but, thanks to his additional placekicking duties, led the league in scoring with 99 points. Leon Hart was not consistently as strong at fullback as he was against the 49ers, running for 348 yards on 76 carries (4.6 avg.) and five touchdowns. “Hopalong” Cassady was also something of a disappointment, with 97 carries for 413 yards (4.3 avg.) and the less-heralded Gene Gedman supplanted him in the lineup. John Henry Johnson ran for 301 yards on 80 attempts (3.8 avg.) and remained the third wheel in the San Francisco backfield behind Hugh McElhenny and FB Joe Perry.